I’ve never been afraid of commitment. In fact, I mostly wholeheartedly throw myself into something and stick with it, never looking back (working out does not necessarily fall into this realm however, but I am working on that), especially when it comes to relationships with people. When it comes to people, I’m loyal and I’ve got your back. I may not always believe in everything you believe in (free will and all) but I will always support you as a person. And I may not communicate with you on a daily basis but if you need me, I’m there, no questions asked. I’m like the neighborhood cat…feed me and I’m yours. Of course, since I’m not stupid or a push-over, if you screw me or my family over one too many times then I’m done. I give second chances and sometimes thirds (depending on the level of intensity in said screw-over) but I don’t have enough time or energy in my life to carry the dead weight. But overall, I’m not afraid of commitment. 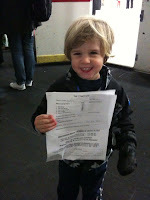 Fussypants, as seen in the above picture (he was so proud of himself), passed his Tot 1 Skating Class with flying colors and is now ready to advance to the Tot 2 class. The group classes are good, but he gets a little distracted due to all the other kids around and because there are 6-8 other children in the class, the individual time the teacher gets to spend with him in the 30 mins of class time is limited. So hunky hubby and I have opted to start him in private lessons. This is where I am beginning to fear commitment. Those lessons start tonight and you know what? Private ice skating lessons are FREAKING expensive. One hour a week (two 30 minute lessons) will cost us $35 for each lesson and $5 for the use of the rink. That’s $80 a week, or $320 a month. Do you know what I can do with $320 a month? Endless possibilities. Group lessons are $110 for 8 (plus whatever the renewal cost for the ISI membership is) but again, the time he spends with the teacher is limited and that’s the trade-off. Our opting to put him in private lessons is a commitment, both to our bank account and to twice a week lessons. It’s our hope that Fussypants will continue to be obsessed with hockey and enjoy the classes and one day be good enough for the NHL. If that happens, then the lucrative NHL contract will wash the early costs away but it’s unlikely. Playing in the NHL is a brass ring that just may be too hard to reach. But after all I’ve seen, done, and witnessed in my life, sometimes it’s best to just never say never and just go on faith. What I do know is that Fussypants LOVES hockey and LOVES skating. He’s so far from actually being good at skating to know yet if this is something he’ll continue for the long term but as a parent, giving your kids every advantage you can is something I believe in. We may end up spending oodles of $ only to have him decide he wants to play soccer at age 6 instead. But I’m hopeful he’ll continue with it and continue to love it and be good at it. And if you divide $40 into 30, then it’s really only $1.33 a minute and that seems like a screaming deal to me. So commitment fear be damned. I’m in. We will figure it out. For now at least. The first private lesson is tonight, let’s hope Fussypants isn’t overwhelmed and picks up some smooth moves quickly! ‘Cause that’s the thing about skating lessons, once he knows how to skate, he’ll no longer need lessons! I'm with you – we have to give our children every advantage possible, but when you start to do the math, it can be staggering. $320 is a lot of dough. You are way ahead of me in this parenting thing, I think MZK has been exposed to enough hockey in his short life to really have a love of it and perhaps private lessons are exactly what he needs right now to see if he could be NHL bound (hard to tell at 3). Good luck and I will look forward to the updates. By the way, I appreciate your loyalty and consider you a dear friend that I am lucky to know. Thanks Tonya! Another thought is that if he is a good enough skater and hockey player, he could potentially get a college scholarship too! So our investment now could be beneficial in the long run! I'm getting really good at justifying all this!